The Karimia Institute proudly launched their Masid App, which is actually a progressive web app at the Mosques Event – Manchester 6th Oct 2018. The event established that modern technology is the most effective means to engage with all members of the community, especially reaching out to the young and ladies who need access to latest information to ensure their children take advantage of all the services available. Many working Muslims who are on the go need quick access to information and this has proved valuable and has resulted in a greater number of attendances. 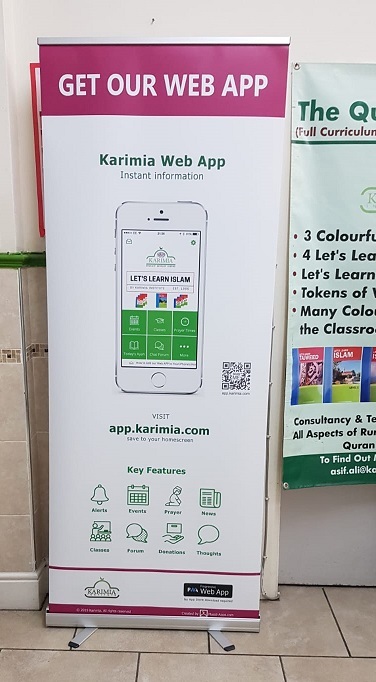 The Karimia web app has been hugely successful due to the effort they have made in promoting it within the community and advertising it on their website and displaying banners within the Masjid. The Karimia Institute founded in 1990 with the support of the local community in Nottingham (UK) and the chief executive officer Dr Musharraf Hussain al-Azhari OBE is a national charity working across England and overseas. They have developed centres for worship, education, training and self-development in various locations around the UK. Masjid Apps is supported by a Market Leading Software company who has funded a program to help Muslim organisations gain access to mobile technology.